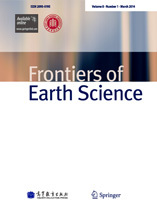 Frontiers of Earth Science publishes original, peer-reviewed, theoretical and experimental frontier research papers as well as significant review articles of more general interest to earth scientists. The journal features articles dealing with observations, patterns, processes, and modeling of both innerspheres (including deep crust, mantle and core) and outerspheres (including atmosphere, hydrosphere and biosphere) of the earth. It aims at promoting communications and sharing knowledges among the international earth science communities. There will be thematic issues periodically featuring particular areas of earth science. The scope of this journal covers a broad range of earth science topics, including, but not limited to, physical geography, geology, geophysics, meteorology, oceanography, climatology, ecology, biology, global change, hydrology, environmental pollution, biogeochemical cycles, natural resources management, ecosystems and sustainability, land use/cover/change, environmental assessment and monitoring, remote sensing, instrumentation technology, data acquisition/processing/assimilation, algorithm development, application and modeling, as well as socioeconomic drivers and societal consequences of changing planet and its environment. Critical reviews and discussions of recently published research papers are also encouraged.